The Moultrie County death certificate for James is spelled Henneberry. The death certificate for his wife Elizabeth is spelled Henebery, and their gravestone is spelled Heneberry. Ship's manifests from the 1840's listed the name as Henebry, Heneberry and Henerbry. The Catholic Church in Bethany is spelled as St. Isadore and as St. Isidore. Ship's clerks, census takers, newspaper reporters and others appear to have used "phonics" to spell names and places. Dates also were subject to errors. Obituaries were also subject to inaccurate descriptions. Grundy County census lists the name as: Henebry in 1850, Heneberry in 1870, Henneberry in 1880 and Hennebry in 1900. David Henneberry (1798-1849) born in County Limerick Ireland. Along with eleven of their twelve children and eight other relatives left the Port of Cork, Ireland aboard the Ship Argyle and landed in the Port of New York City on June 17, 1848. Some of the family members settled in Brooklyn, New York and Waterbury, Conn. Many of the family traveled west and settled in DuPage, Will and Grundy counties in Illinois. In 1850 most of the family was living in Braceville in Grundy County. Since Braceville is only nine miles from Wilmington in Will County, several grandchildren were born in Wilmington rather than Morris, the county seat of Grundy County which was about 22 miles away. Other Henebry's aboard the Argyle: William - age 23, (Passaic Fire Department 1877), John - age 20. James and Ellen Henebry with children: Bridget - age 4, Thomas - age 2, Michael - infant. Speculation as to date of birth of children according to the ship manifest of 1848. Effingham (from Cork) on May 30, 1849 with her husband John Foley and two children, William and James. The passenger list indicated John was age 30, Margaret was age 30 and the two children were recorded as infants. Margaret is probably the oldest daughter of David & Jane. William Foley owned land in Galbally, Ireland according to Griffith's Valuation of Ireland and was the father of John. with his wife Mary. No record exists for Francis, Henry or Garrett in this census. Francis was living in Moultrie County in the 1880 Illinois census. Henry could have moved to Missouri, and Garrett is said to have moved to Montana. Patrick married Julia Magner (Julia could be the sister of Elizabeth Magner Henneberry) on October 23, 1863 in Grundy County officiated by Justice of the Peace, Thomas Alford. Bridget married James Tynan on Feb. 13, 1868 in Grundy County officiated by Father Francis Ryan. 1870 census for Grundy County, IL, Felix Township, page 29. Residing in adjacent farms. James Heneberry and family. Patrick Heneberry-age 30 and wife Julia-age 28, and children: Jane-age 5, James-age 3, John-age 1, and a James Cushing-age 18. David Heneberry-age 38, wife Bridget age 37 and children David-age 13, Anna-age 11, John-age 9, Jane-age 8, Christopher-age 8, Mary-age 4 and Agnes age 2. 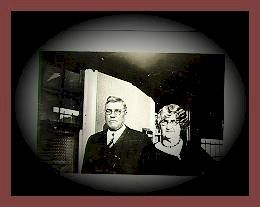 James Cushing-age 40 (probable brother or nephew of Jane Cushing Heneberry) and wife Bridget-age 40 and Johana-age 13. Bessie Henneberry Hayes and family. William Henneberry and family. Francis age 6 and one son born in May and not yet named. 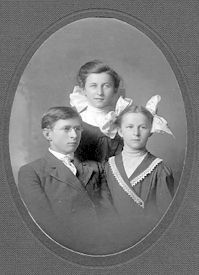 Francis Henneberry age 57; Maggie age 28; Jane age 4 and James Cushing age 22 farm labor. is buried in St. Isidore cemetery Bethany, IL Parents of James: David and Jane Henneberry. 1870 census for Grundy County, IL, Pelix Township, page 29. James Henneberry age 36, wife, Elizabeth age 32, and five children: David-age 14, Margaret-age 5, Emma Jane-age 3, and Elizabeth-age 6 months. Elizabeth-age 63 and Ambrose-age 21.
married Mary Delahunty on Nov 27, 1883 near Dalton City. In the 1920 Illinois census for Moultrie County (ED 167, line 34) David and Mary were living in Dalton City, IL. 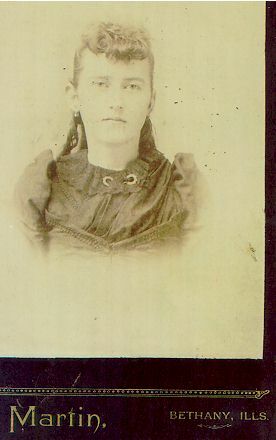 Mary Elizabeth Norris: born: Dec. 14, 1839 in Collinsville, IL. died April 21, 1928 in Niantic. Judith Whitesides: April 28, 1807-April 4, 1876.
married Bernard H. Bresnan on Sept. 28, 1897 in Dalton City; Agnes was 25 & Bernard was 20.
parents of Bernard: John Bresnan and Catherine Conlin. Moultrie County, Dora Township census of 1880: John age 37 and Catherine age 32, both born in Ireland. William age 9, Bernard age 7, John age 4. 1870 Census for Dora Township: John age 27 and Catherine age 24. Also in 1870 Census for Dora Township, on adjacent farm. Edward Bresnan age 55 and Mary age 56, both born in Ireland. Lucy age 15 and Edward age 14, both born in KY, and Ross age 16 born in Ireland. Next farm: Bryan Bresnan age 25, born in Ireland. Decatur Herald & Review: "Mrs. A. W. (Dorothy Bresnan) Burks, 80, of Decatur died 11:10 pm Sunday (Sept. 21, 1986) in Decatur Memorial Hospital. Services will be 10 am Wednesday in St. Patrick Catholic Church with visitation 6 to 8 pm. Tuesday in J. J. Moran & Sons Funeral Home with 7:30 pm prayer service. Burial will be in Fairlawn Cemetery. Mrs. Burks was born in Moultrie County, daughter of Bernard H. and Mary A. Bresnan. She was a member of South Side Country Club, St. Mary's Hospital Auxiliary, Decatur Memorial Hospital Auxiliary and St. Patrick Catholic Church. She married A.W. Burks in 1946. He was president of Burks Pump, Inc. He died in 1968. Surviving is her sister, Mrs. T.L. (Irene) Sheehan of Dalton City. One brother and one sister preceded her in death." 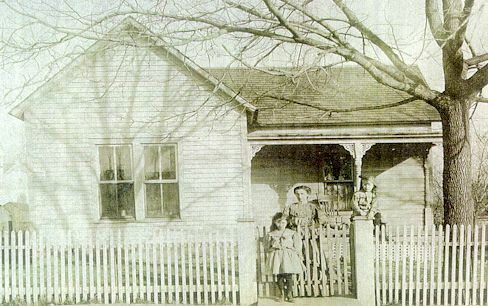 Photo of Lizzie & her daughters Vera & Aimee in Dalton City about 1907. Lizzie Henneberry: born: Dec 5, 1869 in Wilmington, IL Parents: James & Elizabeth Henneberry. married Lewis Dunn on Nov 29, 1893 in Dalton City, IL; Lizzie was 23 & Lewis was 28.
parents of Lewis: Peter Dunn and Mary Dempsey Dunn. More information on the Dunn Family. Both buried in Calvary Cemetery in Decatur, IL. "The marriage of Miss Vera Dunne and Bernard Witt took place in St. Patricks Catholic Church Thursday morning at 7:45 oclock. The marriage ceremony was performed by Rev. Father Murphy. They were attended by Miss Aimee Dunne, sister of the bride and Francis Witt, brother of the bridegroom. The bride wore a brown Duvet de Laine suit with grey squirrel trimmings and hat and shoes to match. The bridesmaid also wore a brown beaver trimmed suit with corresponding hat and shoes. 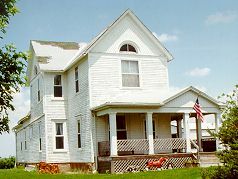 The wedding breakfast was served in the home of the brides parents, Mr. and Mrs. D. F. Kinney, 354 Main Street. The couple left immediately for Chicago. During the week a number of parties were given in honor of the bride. Miss Marie Traughber entertained the Octo club in home near Mt. Zion Thursday afternoon. The affiar was a miscellaneous shower. Mrs. C.F. Kekelsen gave a kitchen shower on Monday evening, entertaining about 20 guests. The evening was spent in hemming and decorating tea towels for the bride. Maurine Elizabeth Witt, daughter of Bernard and Vera: Nov. 20, 1923 - Feb. 27, 1997. Married James W. Brown on Sep. 8, 1945 in St Patrick's Church in Decatur, IL. James W. Brown; Aug. 25, 1922 - Nov. 15, 1990. Daniel Kinney: born 1864 died: 1931. buried in St. Isidore cemetery. Vera born Jan. 1897 age 3. All persons born in Illinois. Daniel Kinney age 42, Lizzie age 40, Homer age 14, Vera age 13, Aimee age 9.